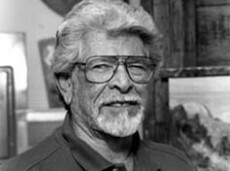 Prolific and proficient in several media, Reese was likely best known as one of America’s premier plein air artists, reveling in the majesty of the Northwest and setting up his easel outdoors in all kinds of weather and in every kind of location. His work is basically the diary of his life. Working mostly in oil, he also produced a large body of works in other media, such as watercolor, pastel, and sculpture as well as drawing, lithographs, and etchings. He works entirely from his life’s interest and experiences. Working from live models and in the field Reese relies heavily on personal observation, each piece a personal statement from and about his life. Reese’s work has been shown throughout the United States and in many exhibitions abroad. His work was included in the first exhibition of contemporary art from the western world in mainland China since China’s reopening.